After Google Shared Stuff dies, how to easily e-mail links? As of 3/30, Google Shared Stuff will be no more. I’m annoyed, because it was an easy bookmarklet-based way to quickly e-mail a link to someone while simultaneously saving it in an easily findable, searchable way. …So I’d switched back to Furl — which is clunkier but also performed those two key jobs. …Then today Furl announces that it’s shuttering. Users can export their bookmarks to Diigo. Whatever that is. Don’t know yet if it will e-mail links easily. I’ll check it out. So this blog recommends using the Google Reader Notes bookmarklet as a replacement. But it doesn’t seem to offer an e-mail function. Market opportunity here, folks!!!! Really, I just want a social bookmarking service that offers an “e-mail link” function from a browser bookmarklet. That’s all. Any takers? NOTE: Dawn Stover has an update on this problem, see end of this post. Increasingly, as Chris O’Brien recently wrote in the San Jose Mercury News, Twitter search is rivaling Google as a top choice to find out what’s happening right now. However, apparently some people who rely on HughesNet for broadband net access via satellite may be, at the moment, unable to use Twitter search. I have searched Twitter Help to no avail. Googling suggests that this may be a problem unique to people who use HughesNet as an Internet service provider — satellite being our only option here in the hills. It doesn’t matter what browser I use. I’m not sure whether it is restricted to Mac users. I’m wondering whether you’ve heard of others with this problem. It is REALLY frustrating because it makes Twitter almost completely useless. 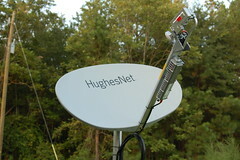 I’m curious: Are many other HughesNet satellite customers are also experiencing this problem? Does it happen in some places and not others? Does this also happen to people using other satellite broadband providers? What’s causing it?